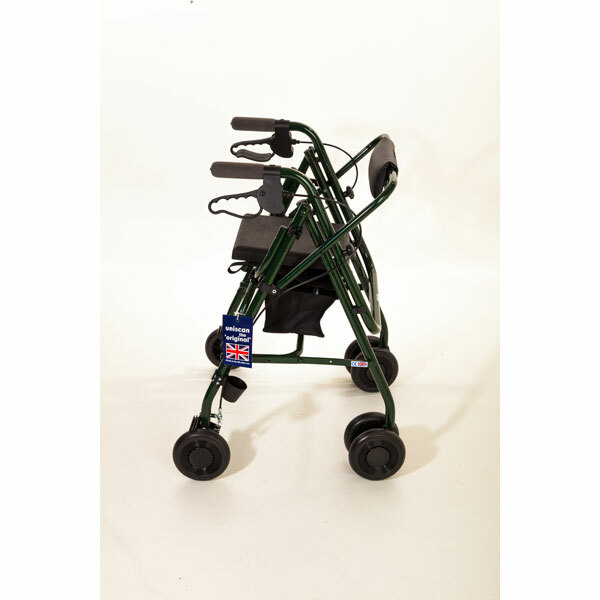 The Uniscan Glider Plus Adjustable rollator is lightweight and provides the ultimate in features and choice. Features automatic folding backrest, choice of seat heights and option of pressure or locking lever brake system. Manufactured in the UK. The Glider Plus Adjustable is the deluxe model in the Uniscan range of rollators and sets the standard by which other wheeled walkers are measured. Manufactured in the UK the Glider is exceptionally lightweight weighing just 6.5kg (14 lbs) and features a unique, comfortable automatic folding backrest as well as adjustable height handles. It is available in four different seat heights and you can choose between pressure or locking lever braking system. It folds flat for storage and transportation and the frame can be securely locked into position using a unique mechanism. Choice of 5 colours - Blue, Black, Grey, Burgundy and Green. Seat heights 17", 19",21" & 23"
Choice of seat height - 17", 19", 21" or 23"
As this product is made to order in the UK, delivery will be made directly from the manufacturer in approximately 14-21 working days.